My friend, Dave Gittus, gave me the photo of a tall pillar with a six-sided sundial at the top, (on the left). Dave told me that it was taken in Monmouth Street, near Covent Garden, London. This enabled me to find out something about the dial. The Seven Dials Monument, to give its correct name, has a fascinating history, as I discovered. After the Great Fire of 1666, there was a great deal of re-development in London. One of the key people in the re-building was Thomas Neale, a Member of Parliament, and one of the influential figures in late Stuart England. King William III granted the freehold of some land to Neale, in return for raising large sums of money for the Crown. This map of the 1740's shows the seven streets Neale planned in a star-shape with the sundial pillar as the centrepiece of his development. 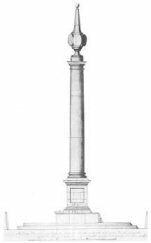 Neale commissioned England's leading stonemason, Edward Pierce, to design and construct the Sundial Pillar in 1693/4. Pierce's plans for the pillar were submitted for approval to Sir Christopher Wren, in his capacity as Surveyor-General. It was regarded as one of London's "great public ornaments". However,and surprisingly, by the 1790s, the London authorities decided that the pillar must be pulled down . For two hundred years, there was no longer a " great public ornament". In the 1970s; the Seven Dials area was declared a Conservation Area. In 1984, the Seven Dials Monument Charity was set up, at the request of Camden Council, in whose area Seven Dials is situated. The Charity's first task was the restoration of the Sundial Pillar. Fortunately, Edward Pierce's original working drawing was held in the British Museum, which enabled the Charity's architect to reproduce a replica of the monument. The pillar is 40 feet tall, made of Portland stone and the six-sided dialstone at the top was designed, carved and gilded by Caroline Webb. In the right are Caroline's designs for the dialstone, based on the calculations of astronomer Gordon Taylor, .In the final unveiling of the Monument on 29th June 1989 was performed by Queen Beatrix of the Netherlands, appropriately since her predecessor was King William of Orange, who was involved in the original monument.